HDMI Splitter, 1X2 HDMI Splitter, HDMI 2.0 Splitter manufacturer / supplier in China, offering 1X2 HDMI 2.0 Splitter 4k with IR (Support EDID, RS232), Bluetooth 5.0 Wireless Earbuds with Auto-Charging Box, Mini VGA to HDMI Upscaler 1080P and so on. The 1x2 HDMI Splitter uses a single HDMI source,accessing to multiple HDMI sinks. 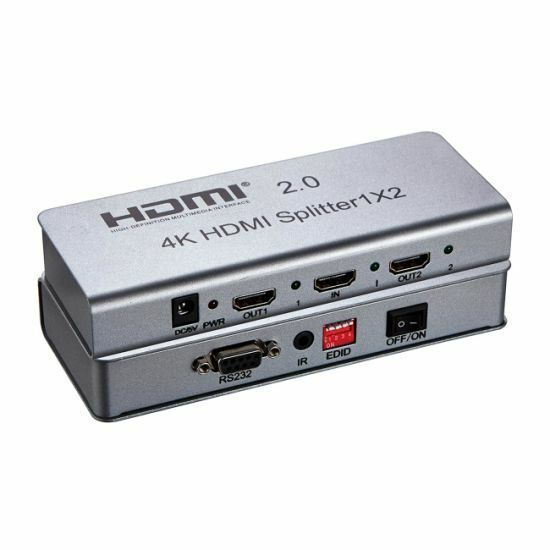 It allows one HDMI device to be split easily to 2 HDMI compatible monitors or projectors. In addition,it can be placed at the end of a long HDMI cable to regenerate the HDMI signal. 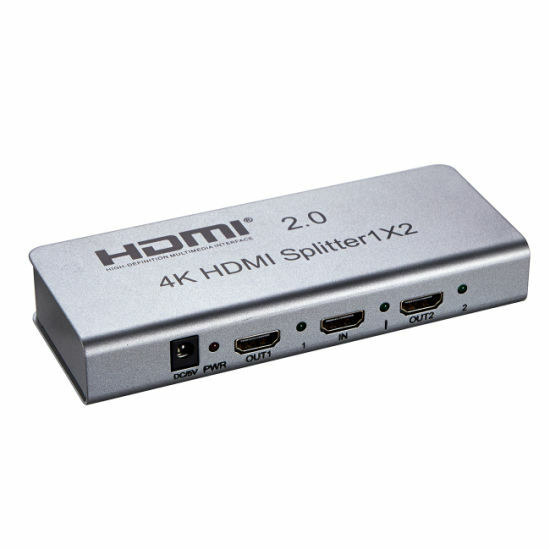 The resolution of this hdmi splitter can be up to 3840X2160/60Hz. This product can support EDID management function, comes with eight kinds of EDID mode, the users can choose according to their own needs. 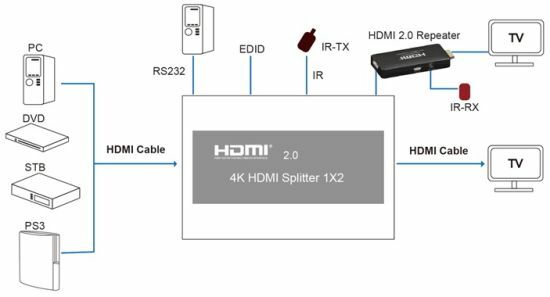 In addition, it is with built-in IR extension function, it can work with our hdmi 2.0 repeater which has IR-RX to receive the IR command to control the source. when the resolution is 1080p and below, input up to 8 meters,output to 8 meters. when the resolution is 4K, input up to 8 meters, output up to 8 meters. Support single HDMI source,accessing to multiple HDMI sinks, the source can be DVD player, A/V receiver, set top box and etc. There are two working mode for product, normal working mode and upgrading mode, which is decided by DIP EDID switch 1, 1 is upgrading mode,0 is normal working mode. Only output1 can support CEC function, output 2 support IR extension function.